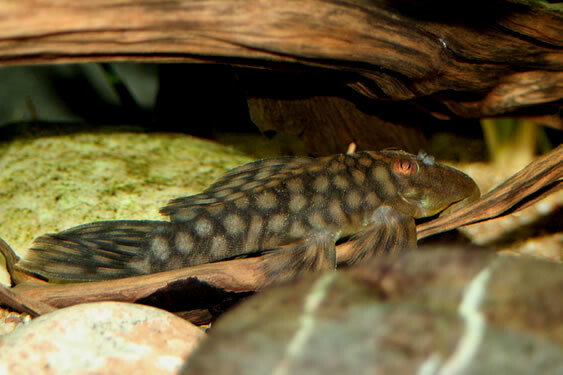 South America: Rio Xingú near Altamira, Pará, Brazil. 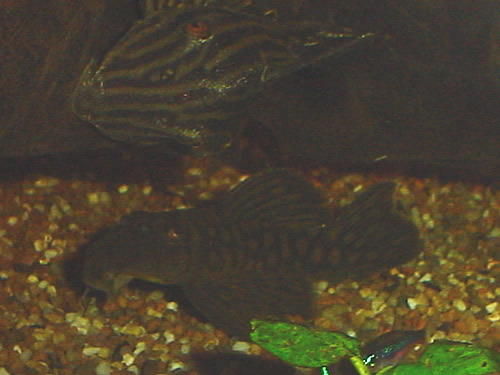 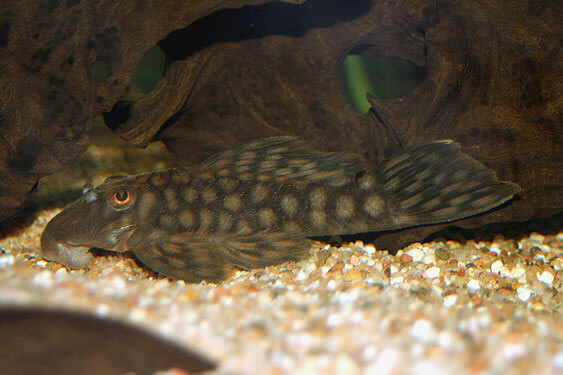 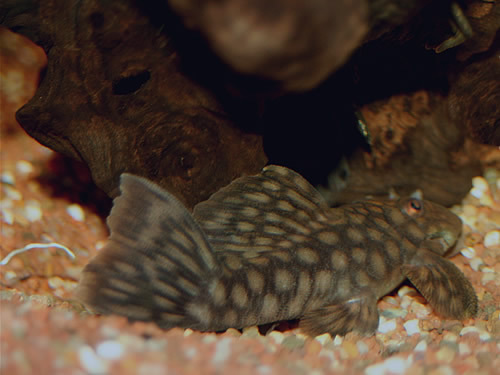 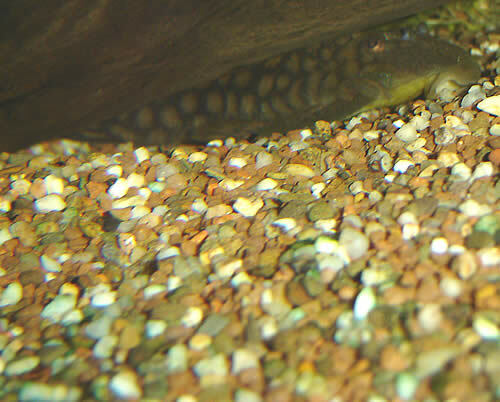 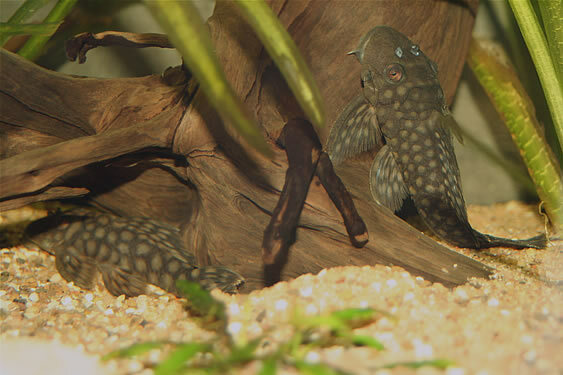 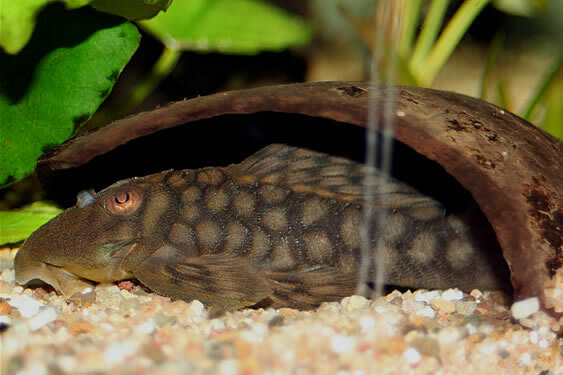 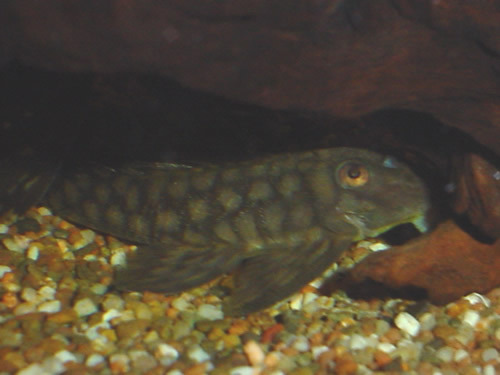 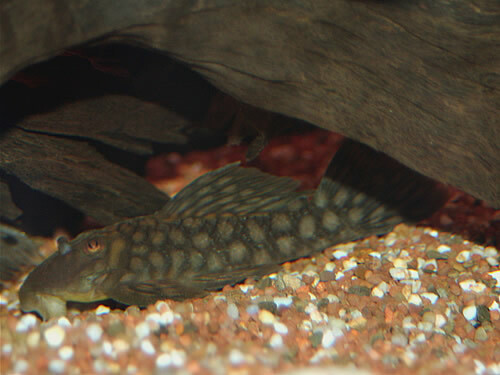 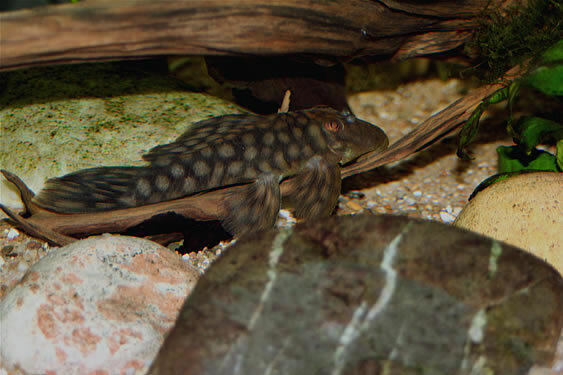 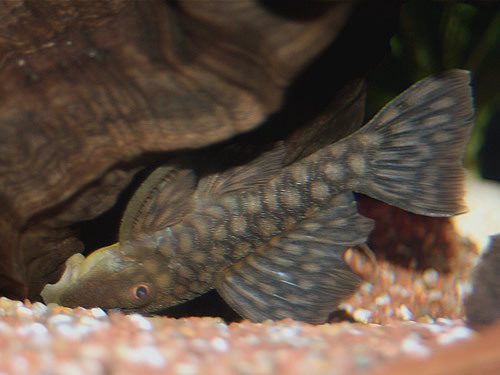 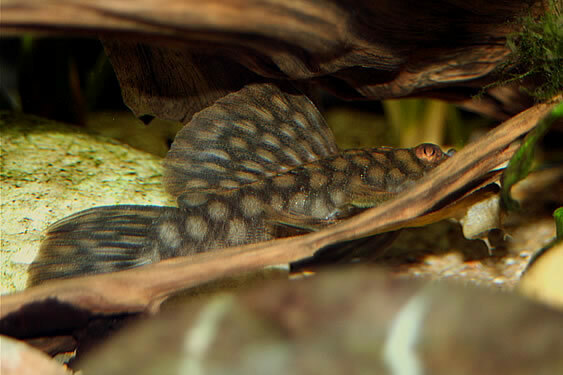 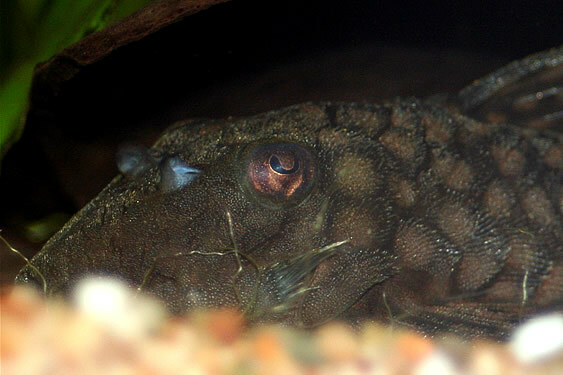 This small catfish-species prefers a dimly lit tank with a good number of hiding places, either created with plants, drift wood, rocks or artificial (pleco spawning) caves. 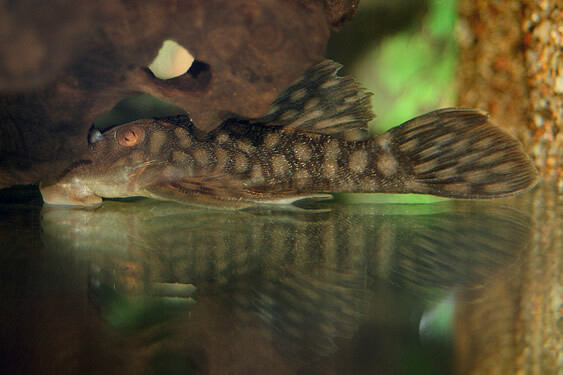 To keep more than one specimen in the same tank, or together with other bottom dwelling fish, you need at least a 40x16" (100x40cm.) 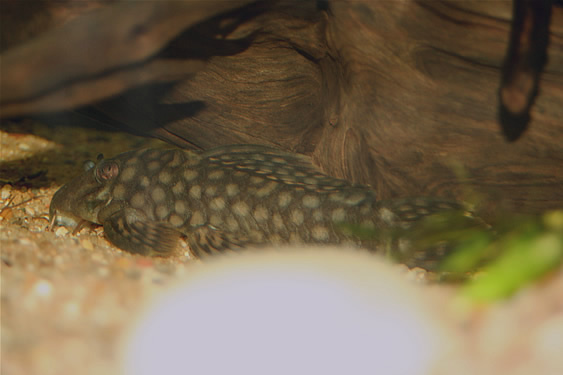 tank: this fish can be quite territorial, and when suitable hiding places are lacking, it can be aggressive towards other bottom dwellers. 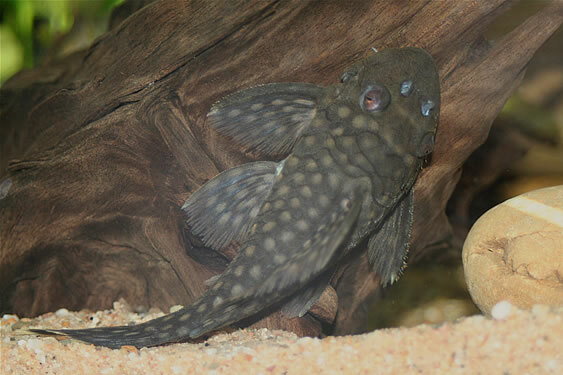 When kept as only catfish in an aquarium, or in case of a (breeding) pair, a tank size of 32x14" (80x35cm.) 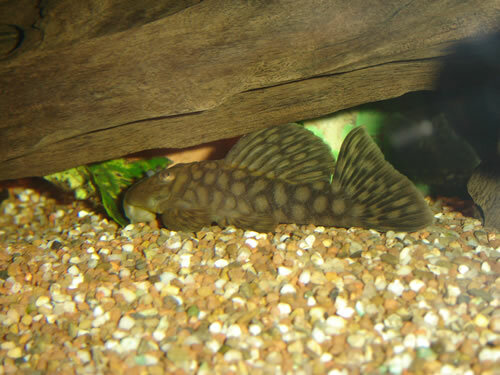 is sufficient. 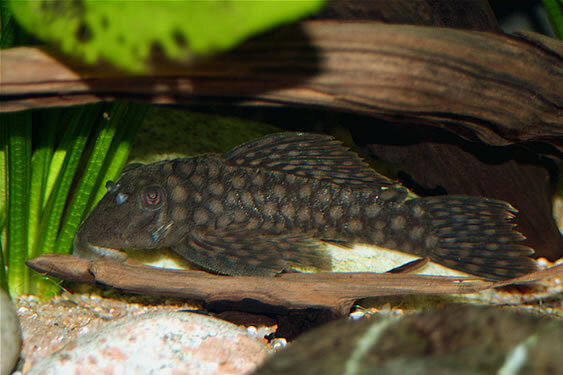 The Polka Dot Pleco does best in soft, slightly acidic to neutral water (pH 6.0-7.0), heavy oxygenation and a lot of underwater currents. 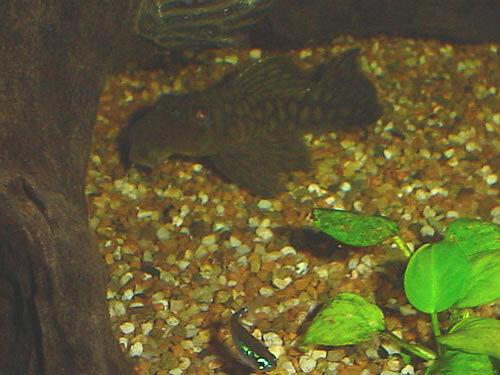 A powerful filter system is recommended, as this fish produces a lot of waste. 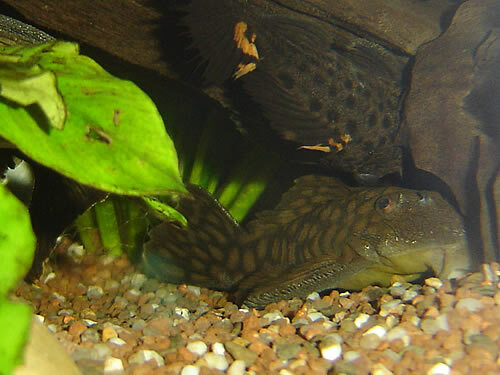 Onmivore: accepts vegetable matter such as algae/spirulina disks and fresh vegetables (lettuce, zucchini/courgette, eggplant/aubergine, capsicum, carrot, peas, preboiled spinach) as well as meaty foods, such as frozen foods (tubifex, mosquito larvae, blood worms, artemia), dry foods (freeze-dried foods, flakes, granules), carnivore sinking pellets, and occasionally some small pieces of shrimp, mussels, fish fillet. 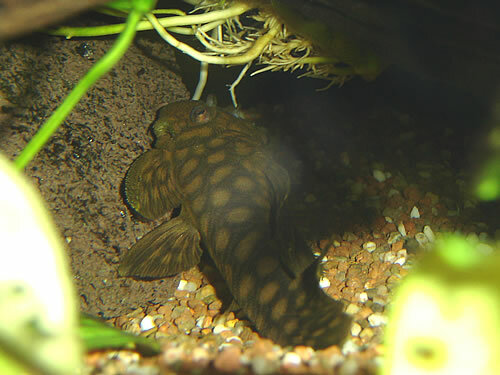 When cramped for space and without enough hiding places, hostilities can break out, resulting in - sometimes severe - injuries. 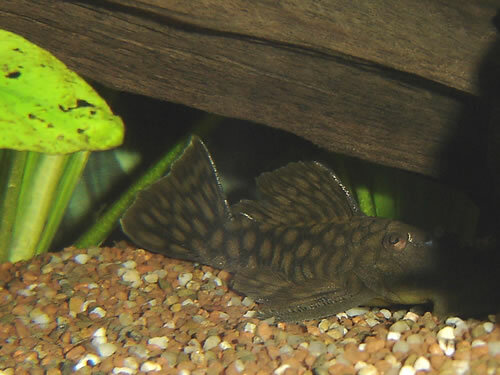 Despite that, the Polka Dot Pleco is best kept in a small group, as it will show more natural behaviour and is more comfortable in when accompanied by a number of others of its own kind. 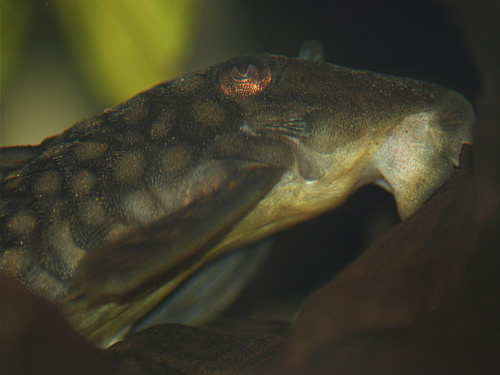 This species has not been bred in captivity yet, but everything suggests that reproduction is carried out in a similar fashion as with many other small Loricarid-species. 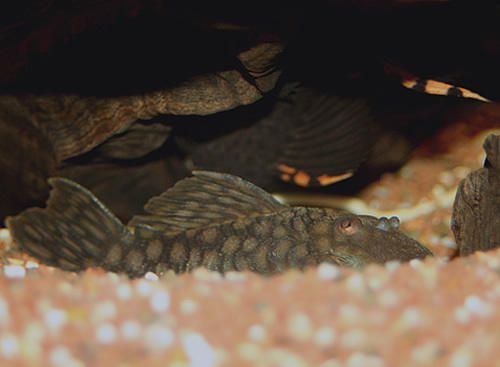 Because of its small maximum size, a relatively small tank is sufficient for a (breeding) group: a tank width a surface area of 100x40cm. 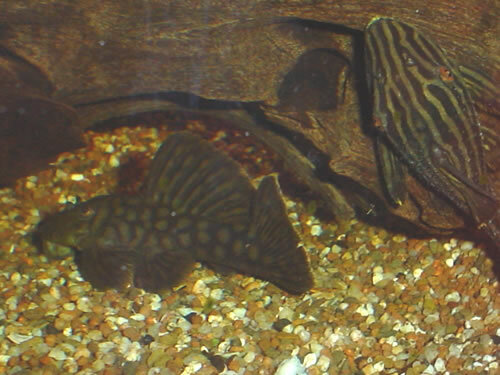 (40x16") is enough to house a (breeding) group of 4-6 individuals: the division of sexes is ideal with one male for every 2-3 females. 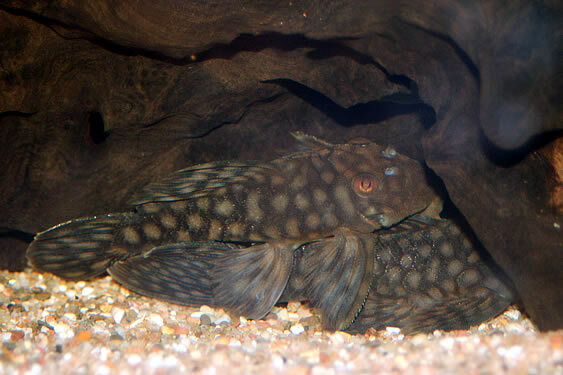 To get these fish to breed, you need a heavily oxygenated tank with a number of spawning caves, a powerhead that runs water along the cave entrances, and a temperature that is raised to 82-86 degrees Fahrenheit (28-30 degrees Celsius). 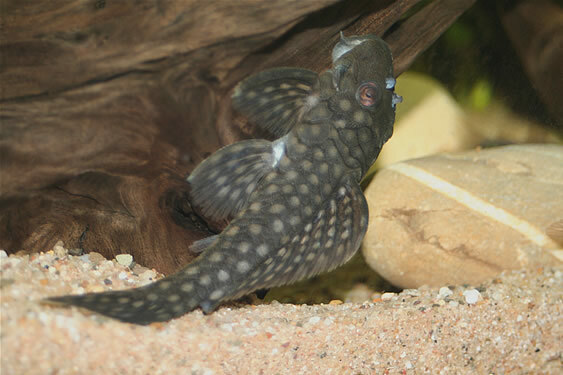 A species very similar to L020, known as Oligancistrus sp. 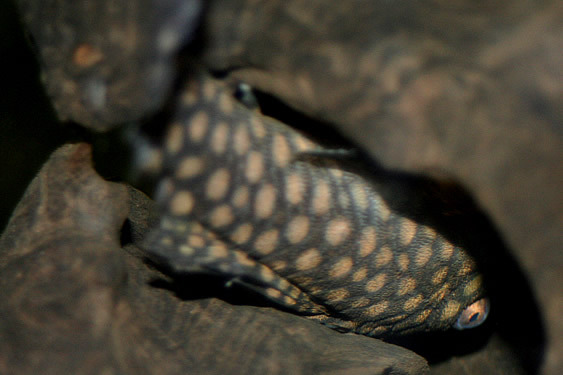 L354 is found in the Rio Iriri river (a tributary of Rio Xingú). 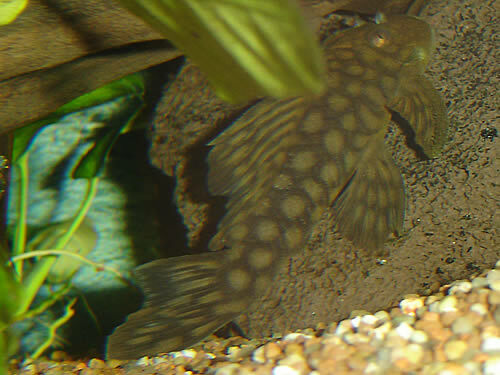 This species however grows larger (up to 8" in size), has larger spots and a much cruder pattern. 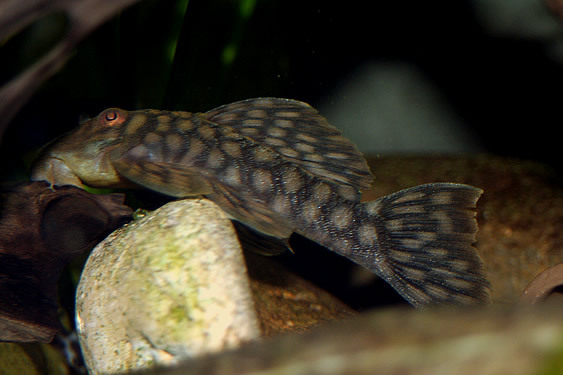 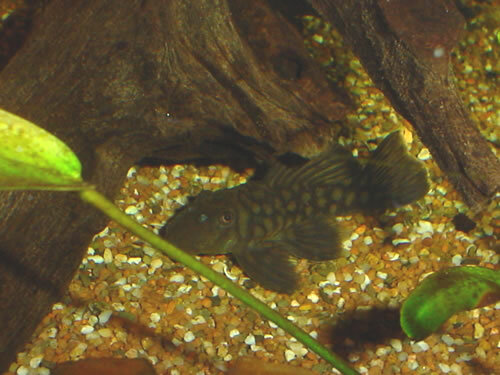 There are also species from other genera that look a lot like the Polka Dot Pleco, like Baryancistrus sp. 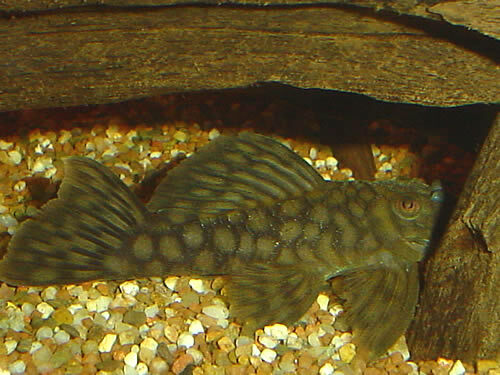 L019, but these species lack the membrane fusing the dorsal fin and the adipose vin together, a feature unique for genus Oligancistrus.